This is the first of three stories about the places Gov. Paul LePage chose and did not choose for federal Opportunity Zone tax breaks. Gov. Paul LePage’s selection of 32 areas of the state for new federal tax breaks reads like a map of big business deals to be done. He planned it that way. LePage’s administration said its picks of Opportunity Zones around the state were driven by the potential for successful new investments. Public comments filed to request those designations shed light on some of the major projects LePage hopes will come to fruition. They include a plan from J.D. Irving, the state’s largest landowner, to rezone and develop camps and commercial properties on 51,000 acres of Aroostook County property, called the Fish River Chain of Lakes region, a project it unveiled in May. Selection of that area also enabled LePage to pick neighboring Madawaska, home to Twin Rivers Paper; however, the paper producer said it does not have any specific plans to use the tax program, and no public comment was submitted to request selection of the border town. They also include plans of a company called Northern Farms LLC to build a 2.5-acre hydroponic greenhouse in Madison and potentially another in Rumford, where LePage picked two tracts as Opportunity Zones. The company is backed by the Northern Venture Fund, set up in late 2017 by energy consultant Evan Coleman, according to state records. Coleman’s firm Clear Energy, which helped develop Madison Electric Works’ solar array, also advocated for zones in Madison and Rumford. The company developed plans for a natural gas storage facility in Rumford, which has sought support from electricity ratepayers and in 2015 earned support from Maine’s Department of Economic and Community Development. The Bangor Daily News found a wide range of business projects that drove LePage’s selections of Opportunity Zones, a new federal program that aims to get investors to cash out existing plays and redeploy that money into businesses in distressed parts of the country. Many questions remain about the program itself, and critics say the program will only fatten investors’ pockets for deals they would have done anyway. But the process of petitioning the governor for a designation revealed much about the economic hopes of businesses, local governments and nonprofits. The zones ultimately selected include parts of the state looking at new projects, such as a cold storage facility on Portland’s waterfront, and a cluster of businesses along Belfast’s waterfront that includes six of Waldo County’s top 10 private employers, not including hospitals. In the case of individual businesses, it also revealed some details of deals to be done. The Bangor Daily News reviewed requests for those designations, LePage’s ultimate picks and top employers in each county to identify businesses or projects that stand to benefit from the program. Nationally, the Economic Innovation Group estimates U.S. investors and corporations are sitting on about $6.1 trillion in capital gains they have not cashed in. Proponents, including EIG, see the tax breaks through the Opportunity Zone as an incentive that will get investors to shift some of that money to businesses in distressed parts of the country. Whether that happens still depends on individual investors, but the review of public records and LePage’s selections shine a light on the places that aim to chase that money after the full rules for the tax break program come out. Maine was one of 32 states to solicit public input on where to locate Opportunity Zones. States took varied approaches to actually selecting projects, with some leaning primarily on data and others, like Maine, focusing on specific projects that had promise. That’s because investors or fund managers will still need to find those opportunities attractive. The longer investors keep their capital gains in a qualifying Opportunity Fund, the greater benefit they get, reducing taxes on those gains and eliminating capital gains tax on their new investment if they keep the money in a qualified fund for up to 10 years. Looking at the places that LePage ultimately selected is then a review of the places where LePage thinks investors will find some reason to put their money down in the near future. That includes J.D. Irving’s plan, for which the Northern Maine Development Commission advocated alongside five other tracts that were not selected. The plan could almost double the number of camps along the Fish River Chain of Lakes, adding as many as 330 new residential lots on about 1,300 acres and commercial development on another 600 acres on Irving’s roughly 51,000-acre parcel. 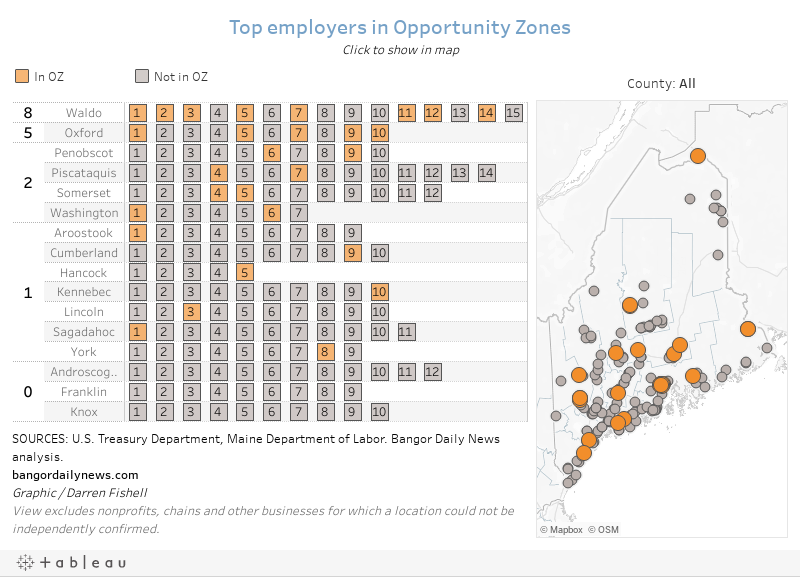 LePage’s picks also include a number of major employers, particularly in Waldo County, where more than half of the county’s top 15 for-profit employers are in Opportunity Zones, all in Belfast. — Subsidized wood-to-energy company Stored Solar’s has plans to add a shrimp farm, greenhouses and an organic poultry farm next to its West Enfield energy plant, which would sell byproducts to those agricultural producers. — Portland officials want to attract a new private investor in a cold storage facility that would serve the International Marine Terminal used by Icelandic shipping company Eimskip, in a zone that also includes part of the city’s Old Port and extends to industrial property at the city peninsula’s westernmost end. — St. Croix Tissue plans to install two new tissue machines, a massive investment that would add roughly 80 jobs, doubling their production and staffing. 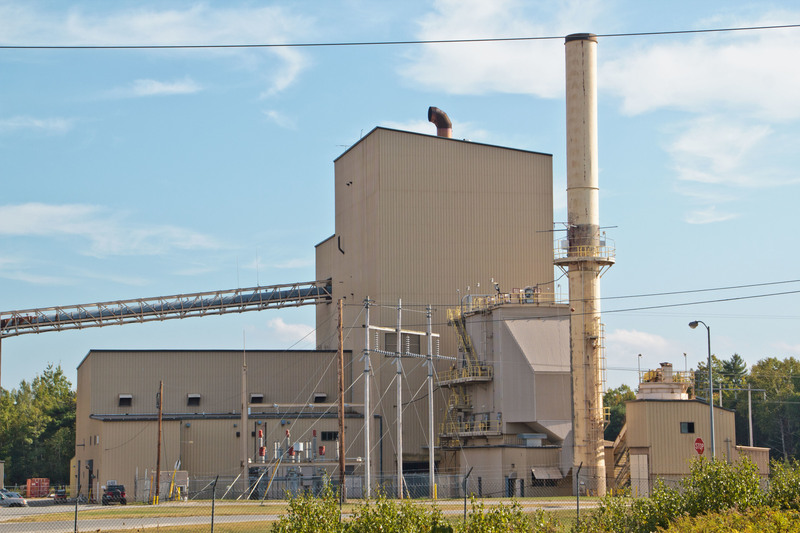 — Investors plan to restart the former Greenville Steam Plant in order to make activated charcoal for medical use and water filtration. — An unnamed Biddeford-based precision machining company plans to build a new 45,000 square-foot facility and hire 20 more employees, potentially at a site in Saco. The consultants Maine & Co., who are consultants to the state on attracting businesses to Opportunity Zones, did not specify which tract in Saco would include that property. — An unnamed developer in Rumford has an option on the city’s new business park, Puiia Industrial Park, “to create an agricultural” project, according to local officials. LePage picked five tracts not requested in public comments, including a stretch of Brewer’s waterfront running from Cianbro’s module manufacturing facility to the south to State Street. LePage also picked a part of Westbrook that includes an industrial stretch of Warren Avenue and Sappi’s mill; all of Madawaska, which includes the Twin Rivers paper mill; a section of downtown Lewiston that includes Bates College; and all of Paris and South Paris. — In Waterville, the Central Maine Growth Council expressed general hopes that the designation could help the downtown, which had the highest unemployment and poverty rates of any tract selected as an Opportunity Zone, at 26.3 percent and 37.5 percent, respectively. — In Saco, city officials said the program could help attract development to a portion of Route 1, between downtown Saco and Scarborough, that they believe is underdeveloped. The tract has the lowest unemployment and poverty rate of any tract designated, at 0.6 percent and 7.8 percent, respectively. — In Auburn, city officials touted their plans to develop their downtown into the New Auburn Village Center, where they plan to have three development sites cleared and ready for investment by the end of the year. — In Bangor, city officials got their second choice, with LePage picking the area south of I-95, down to State and Garland streets, bounded on the west by Essex Street and going just past Mount Hope Cemetery on the east. Officials said the area serves “as an obvious connection between the mall area and Eastern Maine Medical Center and the downtown,” and that they expect the area will see more development for that central location. — In Hartland, local officials said the designation could help fill vacant former tannery space and potentially help Tasman Leather Group, after the town lost roughly 450 jobs over the past decade. — In Bath, city officials said they hope the program will help attract investment to “underdeveloped” parcels zoned for industrial and commercial use, particularly along the city’s waterfront hit by the decline in domestic fish canning facilities in recent decades. — In Lincoln, Madison, East Millinocket and Millinocket, local officials said they hope the designation could help attract new investment to shuttered mills in their towns. Lincoln said they have “a variety of prospects” interested in moving into buildings at the site of the former Lincoln Paper and Tissue. — In Belfast, city officials said the program could help them fill vacant commercial and industrial spaces, including the former Harborside Graphics building, the former Moss Tent building and part of the former MBNA campus, with more than 176,000 square feet of office space. — In Augusta, economic development officials, local government officials and Waterville developer Bill Mitchell said the designation could help provide financing to new downtown real estate projects. — In South Portland, city officials said they hope to attract new investment to an area around the Maine Mall and Portland Jetport, with a district that also includes Sprague’s waterfront oil terminal, adjacent to the Veterans Memorial bridge. — In Calais, an economic development official touted investment in broadband infrastructure as the basis for attracting investors for several unspecified projects. — In Ellsworth, economic development officials said they hoped to encourage investment in a business corridor along Route 3 and through the city’s downtown, including new investments in housing as The Jackson Lab opens a new facility at a former Lowe’s building. — The head of the Loring Development Authority said the former military base has 15 vacant buildings that are “move-in ready,” near one of the longest runways in the eastern U.S., focusing on specific uses, including energy technology, data centers, manufacturing, food processing and aircraft maintenance. — In Brunswick, local officials said they hope the designation would help encourage further investment at Brunswick Landing, the former Brunswick Naval Air Station, a neighboring retail shopping center and at coastal fisheries stretching from Harpswell Cove to Thomas Bay. See the full list of locations successfully requested below. Hover over poverty rate or jobless rate measures to see a map of the tract and click to get a link to that group’s letter to the governor.